Pinch yourself, it really did happen. The king regained his crown, donned that iconic piece of tailoring, and put the cherry on top of the greatest sporting comeback in history. The fairytale every golf fan hoped against hope would come true became a very real, all-too magical reality. 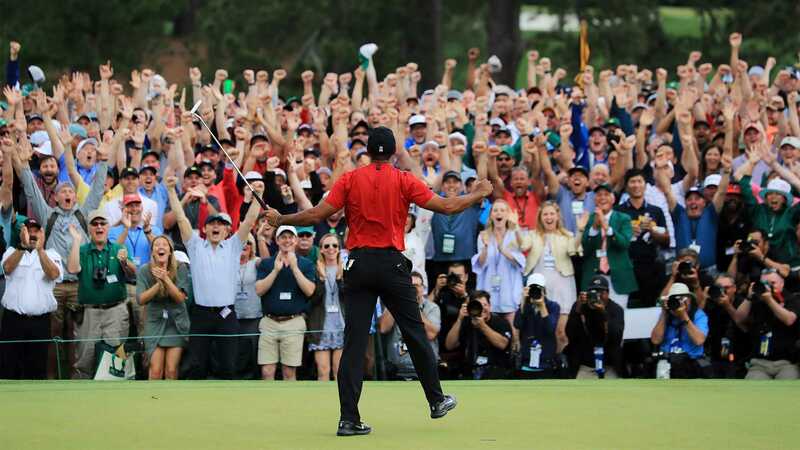 Chants of ‘Tiger, Tiger, Tiger’ still ringing in our ears, we’re going to take a look back at how Woods – just two years after he underwent his fourth and riskiest back surgery to date – schooled the best players in the modern game on how to emerge victorious at Augusta National. The fearsome power of three-time major champion Brooks Koepka, the laser-like accuracy of Open champion Francesco Molinari and the unerring consistency of Dustin Johnson all slipped at vital moments throughout the four-day rollercoaster tournament, but Woods was a totem of stoicism, calm and (dare we say) predatory focus. As the wind swirled on the par-three 12th hole on Sunday, tides of change swept in Woods’ direction. Molinari, the tournament leader for much of Saturday and the final round, blinked for the first time all week: gunning for the pin on the far right side of the green, he came up short and watched his ball roll down the bank into Rae’s Creek. The crowd at fever pitch, the Big Cat took aim at the meat of the putting surface on the easier left-hand side and promptly found dry land. A two-putt par would contrast with Molinari, second playing partner Tony Finau and Koepka who all dashed their Masters hopes with double bogey on the same hole. There’s an old adage at The Masters that nobody wins the tournament on the first three days, but plenty are lost. The likes of Johnson, Koepka, Rickie Fowler and an almost-absent Rory McIlroy all suffered from slow starts, poor rounds or the odd mistake while Woods carefully plotted his way around one of golf’s most remorseless tests. His was a game of patience, ice flowing through his veins, where good shots were carefully capitalised upon and bad shots were patched up with moments of exceptional recovery that minimalised the damage. It meant on the back nine on Sunday that Woods needed little more than to birdie the par-five 13th and 15th to fire his name to the top of the leaderboard. Like a Gary Kasparov strategy that only reveals itself in the end game, Woods manoeuvred the most competitive Masters field in history (11 players finished at ten under or better, more than any other year by almost double) into checkmate through remarkable game management and ruthless shotmaking. The killing blow landed on the 16th hole. Scene of *that* chip in 2005, Woods stepped up to the 170-yard par three and damn-near holed his shot – landing it perfectly at the top of the downslope, only for it to trundle down to the cup, barely slipping by the right edge on its way past. Under pressure, 11 years since his previous Major victory and 14 since his last at The Masters, it is surely one of the greatest single swings in championship golf. The three-feet birdie putt went straight into the heart of the hole. With a two-shot lead over the field, Woods could afford a final-hole bogey before he sealed what will be remembered in the years to come as the day Tiger roared once again; the second-oldest Masters champion at 43 years, three months and 15 days. It wasn’t perfect, we saw errant drives and the odd shaky putt that has characterised an otherwise-peerless return to action, but neither is our man. There was a time when Tiger Woods appeared to do things of which no other living being was capable. But it’s his human frailties – his body, his hubris, his health – that will forever etch his name in the history of sport. Class dismissed.